Near the end of 2016 I purchased a new camera, the Canon 5DS R. I have absolutely loved using this camera for all of my photos in 2017. The 50.6 megapixel image sensor helps produce incredibly detailed and sharp large prints. I have also been using Lee lens filters this year and I'm a huge fan of being able to use a polarizer with graduated neutral density filters. An underwater housing for the Canon was also added to my tool kit and that has opened up a whole new realm of creative possibilities. It's been a fun year using all this new equipment. So what are my top 10 Tahoe area photos? Here they are below. These images and more are available to view, purchase, and order at the Vista Gallery in Kings Beach (Lake Tahoe), at Word After Word Bookshop in Downtown Truckee, California, and at my website www.ScottShotsPhoto.com. Thank you for looking! 1. Truckee is where I have lived with my wife and son for the past 15 years. I love this town. Historic Downtown Truckee is the center of activity and has provided me with many beautiful small town scenes over the years. This photo was shot from near The Cottonwood restaurant a favorite view spot of mine. 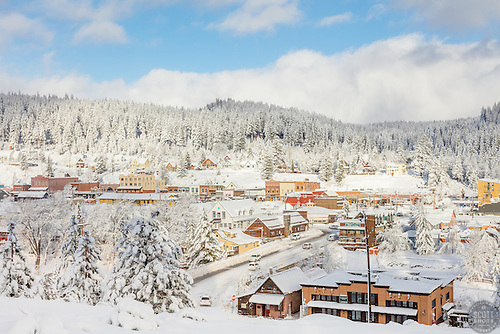 "Downtown Truckee 26" - Photograph of a snowy historic Downtown Truckee, shot in the morning after a big snow storm. 2. Kings Beach, Lake Tahoe is a great place to hang out at in the Summer and enjoy the warm sun and sand. But it's not usually the first place I think of when I grab my camera gear and head out. This day I did decide to shoot the icy shoreline along Kings Beach and boy was I glad I did. It's not the usual big granite boulders and aqua blue water look. However the long exposure, cool tones and warm tones, and the ice and water all came together to give a unique and interesting look to Lake Tahoe. 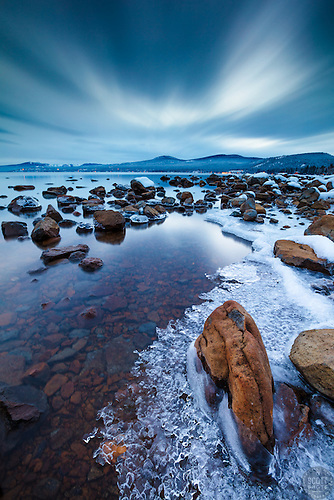 "Icy Tahoe Shoreline" - Photograph of any icy frozen shoreline in Kings Beach, Lake Tahoe. Shot just after sunset. 3. Bonsai Rock.... If you are a fan of Lake Tahoe photos or you follow any Tahoe photo social media pages, you've seen thousands of images of this rock with it's tiny trees on top. It's very difficult to get a unique look. But I think I nailed it with this combination of snow, stormy clouds, super clear water, and a sun setting on the horizon. What do you think? 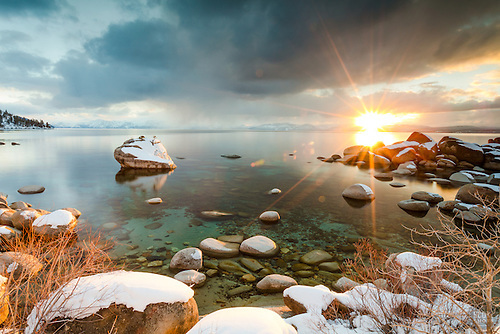 "Bonsai Rock Sunset 7" - Sunset photograph of the famous Bonsai Rock, coated in snow at Lake Tahoe. 4. Rainbow Bridge, or Old Hwy 40 Bridge, is another regular location for many photographers. I have many photos of the bridge but this was a new look I decided to try. A car driving on the road during a long exposure is what made the streaking lights. That and the big moon really make this shot come alive. "Full Moon above Donner Lake 6" - Photograph shot just after sunset of the full moon rising above Donner Lake and Rainbow Bridge in Truckee, California. 5. Thunderbird Lodge, on the east shore of Lake Tahoe, isn't easy to get access to but photographing it from a kayak can be very rewarding. There is a lot of subject matter along the lodge's shoreline, this little lighthouse at the property was where I decided to stay for sunset. An underwater housing on the camera let me partially submerge the camera so the lens was right on the surface. The fiery sunset reflecting on Tahoe made this worth the paddle back to Sand Harbor in the dark. 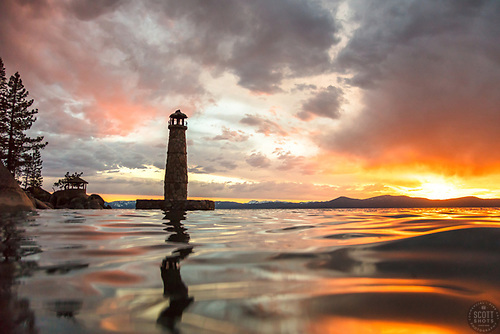 "Thunderbird Lighthouse at Sunset 1" - Photograph of the Thunderbird Lighthouse on the east shore of Lake Tahoe. 6. Eagle Falls and Emerald Bay. Yes, another location overshot by visiting and local photographers alike. How to get a "unique" shot here...? I visited this location with photographer Tony Spiker and we both decided panoramic photos would be a nice look with the strong flow of stream right above the falls. It was a challenge staying out of each other's photos but fun. This is a nearly 180 degree view and you can see up the stream on the right. Multiple vertical images stitched together is how I get this look, this one can be printed huge. 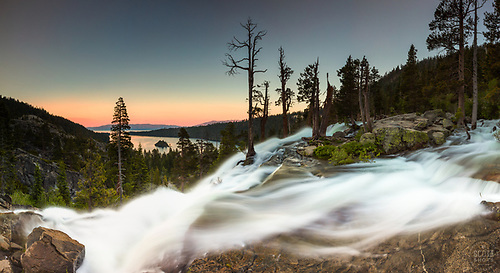 "Eagle Falls at Emerald Bay 3" - Photograph taken at sunset of Eagle Falls and Emerald Bay, Lake Tahoe. 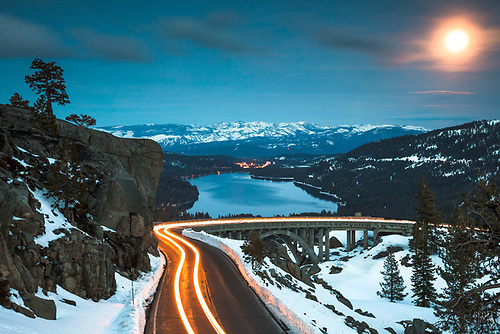 "Full Moon Above Donner Lake 8" - Stitched panoramic photograph of a full moon rising above Hwy 80, Donner Lake, Truckee, Old Hwy40, and Rainbow Bridge. 8. Yes, another stitched panoramic photo. Panoramic photos get requested and purchased so many times at the Vista Gallery (where I sell my prints) that I have been trying to add more to my archive. This Lake Tahoe east shore scene was another great addition. Shooting a wide angle lens vertically helps get an ultra wide and interesting look. "Tahoe Boulders at Sunset 18" - Stitched panoramic photograph of boulders at Hidden Beach, Lake Tahoe. Photographed at sunset with fall colors in the foreground. 9. The Fall colors were great this year. I had many other Autumn shots that almost made this top 10 list but the oranges and yellows in this one really grabbed my eye's attention, so bright and vibrant. I used two flash units to light up the tree in the foreground, otherwise it would have been a silhouette. 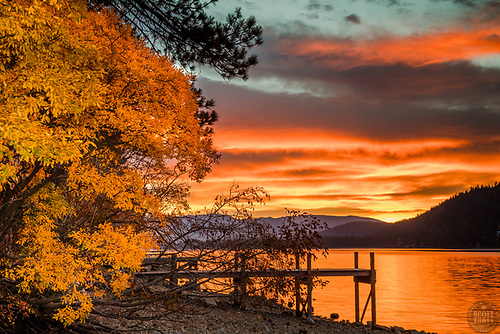 "Donner Lake Sunrise 17" - Sunrise photograph of a vibrant orange sunrise, a dock, and a bush with Fall colors at Donner Lake in Truckee, California. 10. I told you I have many photos of Rainbow Bridge... It's only about a 20 minute drive from my house so sunrises aren't too difficult for me to capture here. 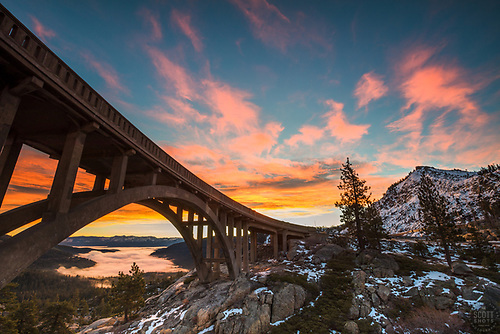 This is a classic view of the bridge but the beautiful sunrise, fog over Donner Lake, and light snow on the ground all came together to create a unique scene that I am very happy with. 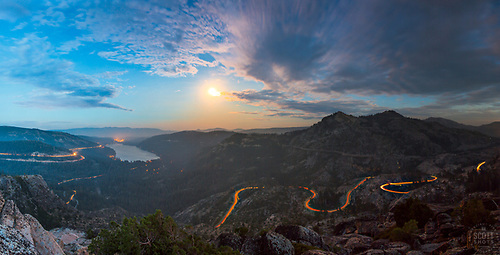 "Sunrise at Rainbow Bridge 3" - Photograph of a vibrant sunrise at Rainbow Bridge above Truckee and Donner Lake (under the fog). Large limited edition prints, gift items, and image licensing of the photos are available.